In college there are hundreds of people sharing one living space. It can be hard to differentiate yourself and feel like you have an identity other than the number on your college ID card. Thankfully, college decor can help you to decorate your dorm so that you feel like your room is your home and you are a person, not just a number. Cheap area rugs will ensure that you make sweeping changes to an otherwise boring dorm room. 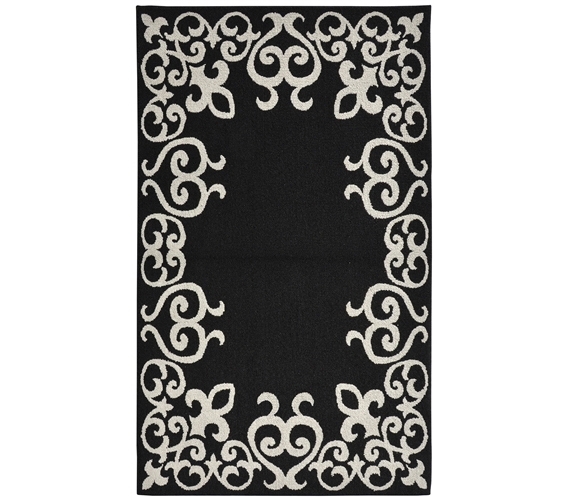 The Bordeaux College Rug - Black and Silver will help you to create an inspiring space that reflects your personality. At 5' x 7' the Bordeaux College Rug will cover the majority of your open space, so that your dorm carpet is noticeable and a prominently featured dorm room supply. In black and silver it will match almost any color dorm decor, so that you don't have to worry if your dorm rug will clash with whatever college stuff your roommate might bring. When going to college there are many dorm essentials, but a cheap area rug should be at the top of your list, it creates a welcoming environment that is sure to help you succeed!